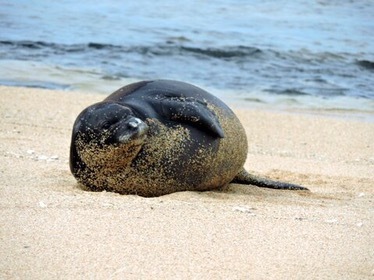 Here are the trials of an extremely plump Hawaiian monk seal pup: When you start rolling down the beach and momentum takes over, you cannot stop. That’s what’s happening to PK2 these days. 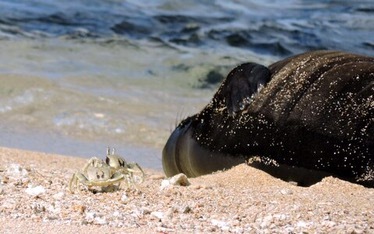 Some fairly recent research* that observed suckling pups in the Main Hawaiian Islands reported pups spent on average a total of 48 minutes nursing per day. Time of day did not seem to play a role. The amount of time varied by week with the greatest amount of nursing taking place in week five or about one week prior to weaning. (That’s right about now for PK2.) In almost every case, it was the pup that initiated the nursing bout, but mother, pup, another seal, and/or waves terminated it. Beach areas were utilized most often in the morning, whereas intertidal zones were more popular mid-day. In the study, moms nursed anywhere from 46 to 57 days before weaning. *Netze, M. 2011. 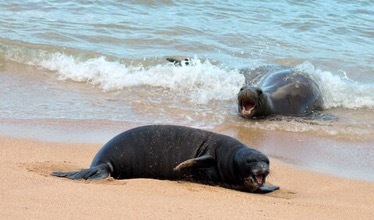 Maternal Strategies of Hawaiian Monk Seals (Monachus Schauinslandi) Inhabiting the Main Hawaiian Islands. RK22 and PK3 had one long swim of about three hours and four feedings today. Once mom weans pup, she’ll head out to sea to fill her empty belly with lobster, octopus, flat fish, and eels. Monk seals are known as benthic feeders, because they typically forage along the ocean floor in a series of yo-yo dives, often using the muscles of their thick heads to flip over rocks to find their prey. 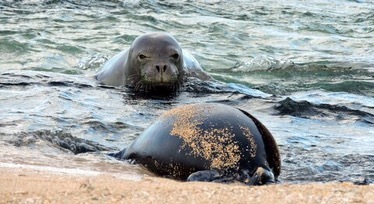 While the deepest known dive of a Hawaiian monk seal exceeds 1,500 feet, they generally make repeated dives to two and three hundred feet for hours at a time in search of food. While each foraging dive lasts an average of six minutes, adults are able to hold their breath up to 20 minutes. 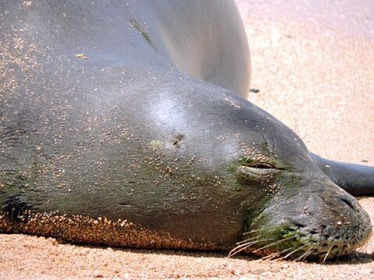 In order to maximize their time underwater, Hawaiian monk seal biology allows them to slow their heart rate down to single digits per minute. A biological phenomenon called brachycardia. Here’s growing PK3 and mom/RO28. Today marks five weeks since PK2 was born, and while it looks like RK22/mom has enough fat reserves to keep making milk for a few more days, maybe even a week, but you never know when hunger will force her to wean her pup. At this point, whenever RK22 does head out to sea to fill her empty stomach, she’s done an excellent job fattening up her pup. When that happens, PK2 will have to figure out how to find food on her own. One thing that will help are her vibrissae. That is, her whiskers. 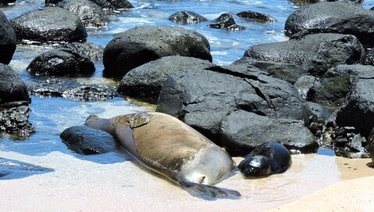 Hawaiian monk seals use their vibrissae to locate prey in the sand or track their food at night or in sub-photo depths. Their sensitive whiskers detect the ripples its prey makes as it moves through the water. How cool is that? Here’s a closeup of PK2’s vibrissae. You can also see how her black lanugo coat is molting, being replaced by a silvery muzzle. As PK2 matures, her vibrissae will one day look like her mom’s, RK22. 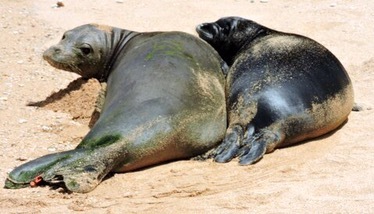 One of the perks of Hawaiian monk seal volunteers is that you get to spend your days at the beach. Some days, treasures wash in from the sea. Like this glass ball, once popular with Japanese fishermen as floats in their nets. Nowadays, plastic has replaced glass, but every now and then a glass ball will appear. Like today. Too bad it was a tad too close to PK2 for our volunteer to sneak in and grab. But if you’re patient, like our volunteer, mom and pup will eventually wake up and go for a swim. Today, our dedicated volunteer observed PK2 and RK22 take one long swim and nurse on three ocassions. Unlike prior days, only one visitor interacted with PK2 today. A crab! 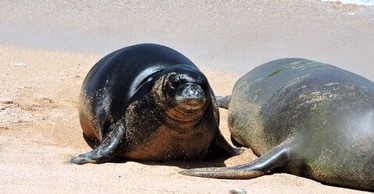 The photos above and below provide a good look at the fore and hind flippers of a Hawaiian monk seal and provide another example of how true seals differ from members of the otariidae family. 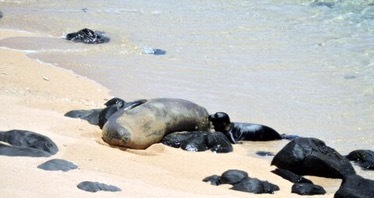 Whereas sea lions and fur seals are able to walk on all four flippers, monk seals do not. They “galumph” on shore. That is, they undulate like an oversized caterpillar. The two families of pinnipeds also differ in the way they swim through the water. 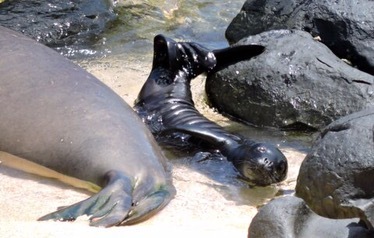 Monk seals use their powerful hind flippers to push themselves through the water. Sea lions and fur seals use their large fore flippers to pull themselves through the water. All pinnipeds have a small stub of a tail between their hind flippers, which don’t seem to serve much purpose but will come in handy after RK22 weans PK2 when biologists will examine her and measure her nose to tail! Down the coast, 11-day-old PK3 (born to RO28) logged a 35-minute swim. RK22 and PK2 had a couple swims today that totaled over four hours and were interrupted for three feedings and a variety of company. 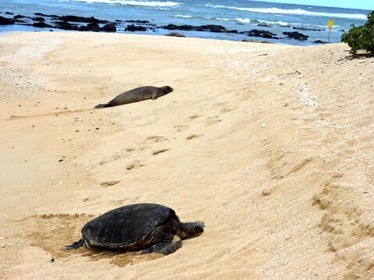 In one photo below, you can see a turtle, RN44, RV18, mom and pup. 3CU was also in the area. By now, PK2’s teeth have started to erupt through her gums. Monk seals have two pair of eight teeth each for a total of 32, just like humans. Here’s PK3. No confirmed gender yet. Still learning how the body works! It’s a bit like Groundhog Day on the beach with RK22 and PK2: Swim, eat, sleep. Repeat. 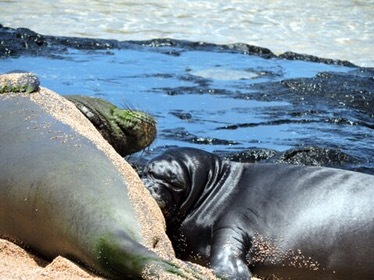 Monk seals spend about two-thirds of their life in the water; hence, a little green algae will grow on their coat. 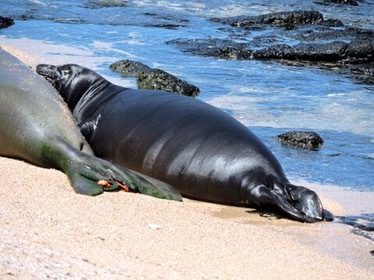 If you see a “green” monk seal on the beach, chances are it’s close to its annual molt. In monk seals, it’s called a “catastrophic” molt, because it happens all at once over the course of a week or two. Can you spot PK3 nursing on RO28 among the dark lava rocks?